Seven Paths to Power is a collection of Centerpath short stories outlining nature’s awesome creative force and more specifically—how her creative process can guide our lives to higher planes. Check out this Excerpt to learn more! 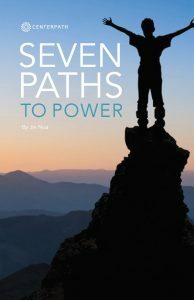 Click here to buy Seven Paths to Power in .pdf format! You can also buy Seven Paths to Power in Kindle format on Amazon. I chose the title not only for its inherent allure, but because it perfectly encapsulates the book’s intent. When I use the term power, I’m referring to the various forms of magic that the universe has to offer—beauty, harmony, balance, and bliss. To achieve this objective, we need a pathway to navigate our way, for which Centerpath provides the perfect conduit. Centerpath provides the right roadmap because its tenants are rooted in nature and her deep wisdoms, and just as importantly, it reveals how these are inextricably linked to our lives. Centerpath allows a glimpse into nature’s workings: how her wisdom applies to our lives; and how, through faithfully following her way, we might elevate our experience to the enchanted and possibly the divine. I hope you find Seven Paths to Power useful, uplifting, and inspiring, and that, in some small way, it achieves my dream of bringing the universe’s magic back into our lives.